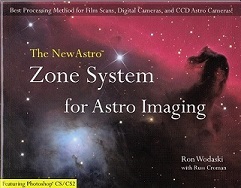 For those exploring the field of astro-imaging and particularly, the use of Photoshop®, this book looks to be great value. There’s lots of information and explanations on how to get the best from your astro-photography. Two copies are available from the library. The Blurb: ‘Everything you need to know to process your astro images in Photoshop® CS/CS2: Step-by-step tutorials with practice files, Photoshop® tips and tricks, full colour illustrations, advice on equipment and techniques. What is the Zone System? Photoshop® is deep and complex. The Zone System shows you how to use specific Photoshop® features in specific ways to get exactly what you want. By breaking the image down into zones, you gain control over all aspects of the image processing, sharpening, smoothing, contrast, histogram, etc.